Three Must-Read Books by John Hogue, written in the year 2017: The Great American Eclipse—Earthquake and Tsunami; John Hogue’s Worldwide Astrological Predictions; and, Trump Strikes Syria: and North Korea? « On the Razor’s Edge of War. False Flag Chemical Weapon attack in Syria imminent as is a direct US-Russian Military Confrontation. Russian Hacks CNN Hoax. Liberal anger and the Republican Baseball Shooting. The Qatar Crisis Ultimatum and is Nostradamus’ Third Antichrist Dead? The Ultimate Weapon of Mass Distraction is the Programmed Mind. Finally, Why did either the Chicken or the Chicken Egg cross the Road? Click on the cover to sample the introduction free and purchase with easy one-click shopping at Amazon. Total solar eclipses seem to trigger seismic events upon the lands and seas their shadows touch. 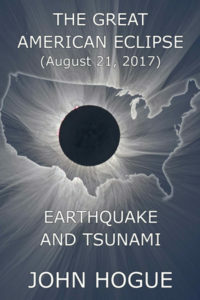 On 21 August 2017, the lower 48 states will have a solar eclipse draw its mysterious darkness of 90 to 100 percent totality over four of some of America’s most dangerous seismic and tsunami-generating quake zones. They are the Cascadia Subduction Zone in the Pacific Ocean along the Oregon, Washington and British Columbian Coasts; the dormant supervolcano in Yellowstone National Park; the New Madrid Fault Line in Missouri near the Mississippi River; and finally, the earthquake-prone Charleston, South Carolina area along the Atlantic Coast. If the pattern of seismic activity seen in the Great Eclipses of 1999 and 2009 is repeated in the Great American Eclipse of 2017, then either one or a series of potential major quakes of magnitude 6 to a megathrust of magnitude 9 could happen a week to three months after the eclipse. A second wave of seismic episodes of the same potential magnitude could follow 8 to 18 months after the eclipse. Less frequent but no less damaging episodes of quakes and tsunamis could take place as late as 2 to 5 years after the moon’s shadow on 21 August 2017 had touched future epicenters inside these four seismically sensitive zones. Cities and towns across the United States, even in the earthquake prone West Coast areas, are woefully unprepared for such natural disasters. If only one, two or all four seismic zones become active after the eclipse, the devastation could bring the greatest superpower in history to its knees through a string of natural disasters. Great earth change prophets like Edgar Cayce, Ruth Montgomery and Nostradamus have accurately dated and located future history-altering earthquakes and tsunamis. They have also tried to warn the world to prepare for and survive future upheavals, not only of earth and ocean, but financial, economic and political quakes soon to challenge the most powerful nation on Earth as if it were fabled Atlantis from mythological times—the advanced and militarily unstoppable island hegemon of pre-history, laid low by natural catastrophes. Is America, by coincidence or mysterious Fate’s intent, about to suffer a repeat of what took down the Atlanteans? World-renowned prophecy scholar and Nostradamus expert John Hogue will take us through a journey mixing seismic evidence with prophetic and astrological forecasts that will try to illuminate what will really happen, if anything, following the moon’s shadow passing over America, from sea to shining sea. The Great American Eclipse comes at a time of significant astrological portents that not only can bring a life-changing experience to President Donald Trump but also to 330 million Americans. America is stuck and something has to give. Political fault lines in polarized Washington DC and fiat faults grinding out economic fantasy must rock, roll and rent. Earthquakes can be a creative catalyst for unexpected uplifts of national attention that rethink, redefine and rebuild America for the better. This eclipse may mark the overshadowing of American hegemony over the world, yet John Hogue will share hopeful prophecies indicating that America’s greatest and happiest days are ahead, once American is no longer burdened by being a superpower. John Hogue is unique. He’s one of a kind. Evil Forces in the Moon’s Shadow? Purchase now The Great American Eclipse: Earthquake and Tsunami at this link to the Amazon sales page with simple to use, one-click shopping. Thank you. Click on the cover to sample the introduction and opening chapters free and purchase with easy one-click shopping at Amazon. John Hogue is taking the stars back to an “ancient” future. Tomorrow’s astrologers will embrace what early astrologers and pagan civilizations understood: Spring is opening season of the natural New Year! Have your parties starting around the Vernal Equinox and continue to celebrate the transition of seasons all through April, Easter and up through May Day. In the future, even Christmas will be moved to March when it will be discovered that Jesus Christ was born a “fish man” master, symbolized as a “fisher of souls,” foreseen by ancient seers as the world teacher of the Piscean age. Two fish tied together represent Pisces. One represents the conscious, the other, the unconscious mind—both are engines of human predictability. Hogue explains the papal origin of why New Year’s Eve is celebrated in the dead of winter. He then takes us through the correct procession of changing seasons from birth (spring), peak life (summer), let go (autumn) and death’s fallow peace (winter) exploring world events in the timeframe of seasons progressing in their corrected annual sequence. He will apply his 30 years experience of studying the astrology and medium work of Nostradamus to document highly accurate astrological forecasts—saddled to pure divination—that confounds astrologically dogmatic critics as it accurately illuminates. This detailed and unique examination by a world-renowned astrologer and Nostradamus expert takes you through a detailed, day-by-day reading of coming world events. First he establishes what was astrologically “born” out of important worldwide elections from spring into summer of 2017 and then predicts the negative and positive consequences coming from August 2017 through June 2018. Read one of the most detailed and comprehensive forecasts of the astrological significance of what happens during the Great American Eclipse in August 2017. More than this, Hogue prepares you for earthshaking changes that it will herald for America and the world in natural upheavals of the Earth, as well as political earthquakes, the renewed volatility of Wall Street, and the crises approaching for the fiat and global economy. Hogue’s future chronicles can be funny, shocking, even terrifying, but ever original and ultimately illuminating intense times lived in the death and rebirth of an age in ways only he can originally and accurately foresee. You’re Brexiting Out All Over Again! Hot Winds, Wars and Terrorist Raids? 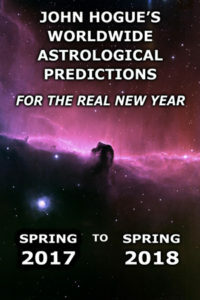 Purchase now John Hogue’s Worldwide Astrological Predictions for the Real New Year: Spring 2017 to Spring 2018 at this link to the Amazon sales page with simple to use, one-click shopping. Thank you. I have known John Hogue for fifteen years. Every year, he predicts on the program [Dreamland] and every year, he proves to be fireproof. He’s accurate. Uncannily accurate! 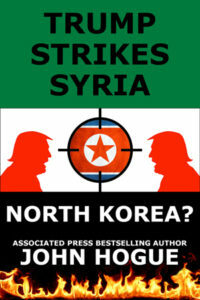 Purchase now Trump Strikes Syria: And North Korea? at this link to the Amazon sales page with simple to use, one-click shopping. Thank you. This entry was posted in Books by John Hogue and tagged al-Qaeda, America atlantis, America's future, American hegemony, antichrist, Art Bell, Astrological predictions, Atlanteans, Atlantis, Barack Obama, Brexit, Bush, Cascadia Subduction Zone, Charleston SC, climate change, Coast to Coast AM, cold war, Deep State, Donald Trump, Dreamland, Edgar Cayce, George Noory, Hegemon, Hogue, Idlib chemical weapons attack, Iraq, ISIS, Islamic State, Israel, Israeli-Syrian War, John Hogue, Kim Jong Un, Loose cannons, Meditation, Middle East, Myths about North Korea, national security state, New Madrid Fault Line, North Korea, Nostradamus, nuclear war, Osho, prophecies, prophecy, prophet, Quakes, Ruth Montgomery, South Carolina seismic zone, Syria, Temblors, the Bluff, the great American eclipse, the New Atlanteans, Third Antichrist, Trump, Trump strikes Syria, Tsunamis, Vernal Equinox, vernal year, volcanic eruptions, War with North Korea, War with Russia, Washington Swamp, Whitley Strieber, Yellowstone supervolcano. Bookmark the permalink. Post a comment or leave a trackback: Trackback URL.